American Airlines provide delectable in-flight entertainment to cater to a wide variety of customers including NBC Universal for American, traditional movies, music etc. The nature and content of entertainment depend on flight duration. Customers can enjoy American Airlines programming using their personal headsets, or headsets that can be bought onboard for a modest price. Customers who buy headsets are allowed to retain them for use on future American Airlines flights. American Airlines reportedly offers travelers around 400 feature films per year, choosing new movie titles every month. There is group entrusted with responsibility for in-flight entertainment programming and they are authorized to select features to fulfill the ever-changing needs of air passengers. As stated earlier, American Airlines offers its domestic flight passengers NBC Universal for American, in addition to movies. All domestic programming is offered in both English and Spanish and internationally offered in English and the local language wherever available. For instance, flights to Shanghai will feature some Mandarin/Chinese movies with English subtitles. During holiday season when families travel with children American airlines traditionally offers more family-oriented titles. As is known to many, NBC Universal produces four exclusive programs of 90-minute duration every month for Americans - featuring television shows from NBC, USA, Syfy, Oxygen, Bravo, CNBC and MSNBC, as also films from Universal Pictures and programming from NBC News, NBC Sports etc. As regards music, passengers can listen up to 16 channels of music and also a variety of music including Jazz, Latin, Classical and Japanese - amongst others. You can always visit https://entertainment.aa.com/en/personal-device/ to know what is playing in-flight. American airlines have lately collaborated with Samsung to provide its customers lot more entertainment options inflight. The Samsung Galaxy Tab 10.1 devices are now available onboard American in premium class cabins on select flights. Featuring over 60 movies, including 30 new releases, as well as different television programs and audio selections the tablet is designed to cater to the diverse preferences of American’s customers - comedy, sports, drama programs etc. The tablets are user-friendly and customers can choose settings based on their own preferences. 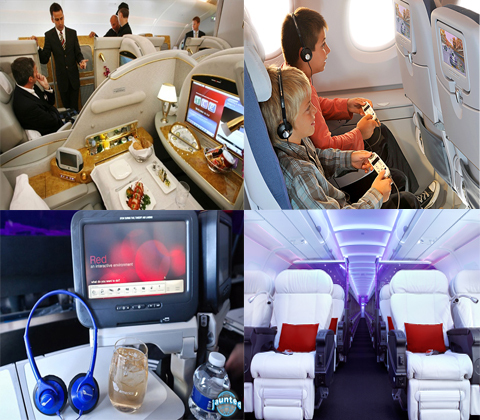 There is an intuitive design providing easy access to their favorite programs throughout the flight. The United States is known for its world-class entertainment, and on American Airlines you will be overwhelmed with choices galore. Passengers traveling on Boeing 777 aircraft and Business Class passengers traveling overseas on a Boeing 757 aircraft can view programs on adjustable in-seat entertainment devices that offer a wide array of feature movies, music, games and television shows via audio and video on-demand. Premium customers availing the in-seat entertainment system will have the added facility of fast-forwarding and rewinding the program. There is a host of Inflight entertainment language options that include English, Spanish, Portuguese, French, German, Chinese and Japanese. American airlines recently launched entertainment on demand service - an imaginative customer offering. Entertainment on demand is an inflight video product that lets customers to wirelessly stream content like movies and TV shows from an inflight library to their personal Wi-Fi-enabled laptop during flight. There are four American Airlines In-Flight Publications - American Way, American Airlines Nexos, Celebrated Living and Eagle Latitudes.